Xue Shan Shan: Expert on all things bling jewelry. You know that Shan Shan means business when she’s more concerned about chasing that paper than checking out what’s on the party’s buffet table. Before we know it (okay…more like 10 million yuans later), the Shan-Teng’s wedding is going to be back on! C’mon girl, we’re all waiting for you to officially become Mrs. Feng! After Shan Shan saw through Feng Teng’s plan to secretly rent her and Liu Liu his own real estate for their upcoming jewelry business, Feng Teng turns around and calls up Yan Qing to ask about the property that his mom recently purchased. The real estate agent brings the girls to that very property, and even successfully pretends to be reluctant to lower the rent price for them. But of course, Feng Teng’s on the other end of the phone and agrees to Shan Shan’s conditions. And just like that, Liu Liu and Shan Shan have the store for their jewelry business. Those chairs look mighty uncomfortable. Papa Xue comes to find Feng Teng at his apartment and asks him if he plans to keep on dating Shan Shan while she works to pay back the 10 million that they owe the Fengs. Feng Teng tells him that he and Shan Shan are in love so there’s no reason for them to break up. Papa Xue is still worried that it’s not going to be an easy or quick thing for Shan Shan and Liu Liu to earn the 10 mil. Feng Teng reassures him that even though Shan Shan isn’t at Windgroup anymore and out in the business world on her own, he will still continue to take care of her. Papa Xue is feeling a bit better hearing that his daughter is going to be well taken care of. When Liu Liu is showing Feng Teng around the store amidst its construction, Shan Shan comes running into the room to announce that there’s a huge cockroach there. She and Liu Liu quickly kill it off, but when they look around afterwards, Feng Teng is nowhere to be found. Shan Shan looks up and sees Feng Teng standing on top of chair, out of the way of the cockroach while the girls were killing it. Haha! Way to lose your manly points there. The girls are super amused to see the mighty Mr. Feng Teng scared of something as lame as a cockroach. Ahem. You ok there, Feng Teng? Shan Shan later asks Feng Teng to help her pick which ring to promote for their business’s grand opening, he points to the bright red one while saying that he likes the pink one. Shan Shan asks him again if he’s sure that he likes the pink one while waving the red one in his face, and he says yup. She tells him that the one he just picked out is the bright red one. Feng Teng sheepishly tells him that she shouldn’t ask him when it comes to red-colored things because he’s colorblind. Shan Shan is both amused and incredulous that after the wimpy incident with the cockroach, Feng Teng also can’t differentiate colors properly. How about the …blue one? After finding out all these new fun facts about Feng Teng, Shan Shan keeps asking him about his weaknesses. But in a cute way, so it wasn’t annoying. Feng Teng seems to be pretty entertained by all her questions too. During dinner, she asks him why there’s melon in the dishes tonight when he knows that she doesn’t like it. He in turn asks her if she’s even turned into a picky eater now too. She tells him that she only learned it from him. Truth. While the Fengs are pruning their plants together (totally a rich person thing), Feng Teng tells Feng Yue and Yan Qing that he’s really happy that Shan Shan is starting to find out and notice things about him that makes him seem more like a real person, and not just Windgroup’s boss. She’s beginning to notice that he has flaws, and he’s amused that she’s even turned into a picky eater. Feng Teng later thinks to himself that through this 10 million debt that Shan Shan is working hard to repay him, they’ve become even more like a real couple than before. Shan Shan and Liu Liu have the grand opening for their new business, F.S. Jewelry Design, and the response towards their products seems favorable. While Shan Shan is explaining to reporters the concept behind their brand, she even names the kdrama, My Love from Another Star as inspiration for some of their jewelry pieces (Do Min-joon!). The only minor drama from the day comes from Feng Teng finding out that the son of one of his important business partners is working at F.S. as a jewelry designer. But he doesn’t seem too concerned about it, so I guess it’s no big deal. Bring out the big scissors. At Li Shu and Zheng Qi’s engagement party at the Feng mansion, Shan Shan is going around advertising her business to all the guests. Compare this to the old Shan Shan who would have definitely been hanging around the buffet table during a party. The guests all gather outside in the courtyard to send off Zheng Qi and Li Shu from the party, and everyone says some very lovely and touching words to the couple. Feng Teng reminds Li Shu that she will always have him and Feng Yue as her family. Li Shu promises them that she will definitely be very happy in this new chapter of her life. And off into the sunset Zheng Qi and Li Shu went. Feng Teng asks Shan Shan what she wants for their own wedding. She figures out a bunch of stuff that she doesn’t like, but still doesn’t know what she does like. No worries, they still got a year to figure things out. Shan Shan thinks to herself that she can feel that her relationship with Feng Teng has changed for the better ever since she left Windgroup. No longer is she the obedient food picker-outer from before, but now can consider herself to be Feng Teng’s real girlfriend who is more of his equal. Girl power! Shan Shan happily tells Feng Teng that F.S. made 50,000 (RMB) the first month, and wants to give it to him right away to go towards paying off the debt. He won’t accept it and tells her that the company needs to keep some money around, and can’t just give him everything that they earn. Instead, he tells her that when they’ve made 100,000 in a month, then can she start paying him back. Charge it on my card. Feng Yue and Shan Shan go dress shopping because the annual Windgroup company party is coming up soon! You remember, right? That’s the party where Shan Shan and Feng Teng left early, and they shared their first kiss under all the twinkling Christmas lights. Awww Shan-Teng ❤ memories. Shan Shan tells Feng Yue that she needs to win the “Most Elegant Woman” award at the party this year, so that she can better promote the F.S. jewelry that she’ll be wearing. Feng Yue and Yan Qing are over at Feng Teng’s place waiting to go to the party with him and Shan Shan, but Shan Shan is taking her sweet time getting ready. Feng Teng tells them that she’s actually been getting ready for the party for the entire day already. Feng Yue asks him if he’s been pushing her too hard to quickly repay the money that Shan Shan’s gone totally insane. Feng Teng reassures her that the only thing that Shan Shan would ever go insane for is food. Ha. Just a few more coats of mascara. At the party, everyone’s jaws drop when they see Shan Shan all decked out in her party dress and walking in with Feng Teng on her arms. She does end up winning the Elegant Woman award and is off to dance with Feng Teng. 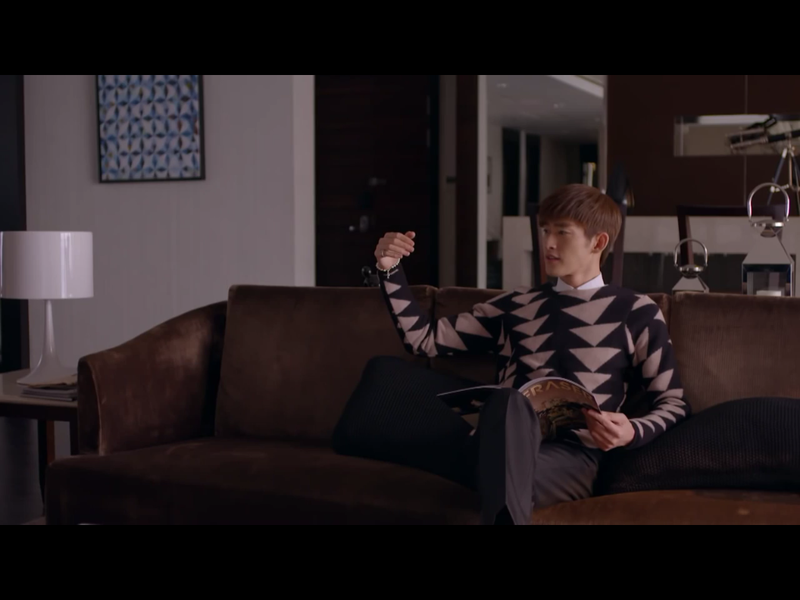 Meanwhile at F.S., the rich guy jewelry designer, Wang Hong, is waiting for Liu Liu to get off work because he has a crush on her. And who should show up at the store but the #1 Douche aka Liu Liu’s ex-bf. You know, the one who stole the 10 million from the business to begin with. Liu Liu obviously demands him to give back the money immediately, but the Douche has zero shame and refuses to pay it back. He says that he doesn’t see how losing that money was a big deal for the Fengs. Instead, he tells Liu Liu that she’s the one who owes him money. His dad had previously invested money into the business that he had embezzled from, and Liu Liu used that remaining money to start F.S. Therefore, Liu Liu stole money from him and he’s here to get it back. Great logic, Douche. Liu Liu laughs in his face and threatens to call the police right away. Douche tries to wrestle the phone away from her, and they end up in some sort of tug-of-war over it. Wang Hong finally jumps in and tries to pull Douche away, but ends up getting pushed by him into one of the nearby glass displays. Liu Liu calls Shan Shan while she’s still at the party and tells her what happened at F.S. Feng Teng and Shan Shan immediately rush over to the hospital where an injured Wang Hong is being bandaged up. Liu Liu tells them that the Douche has already been arrested and shouldn’t be a problem for them anytime soon. Wang Hong also tells them that he’s fine, and should get better with a few days rest. When they’re home, Shan Shan is going on about how Wang Hong must really like Liu Liu to step in to help her out. Feng Teng, on the other hand, has his brows furrowed and tells her that from now, Shan Shan’s to stop going to work at F.S. After tonight’s incident, he’s concluded that the store is just too dangerous for her and she shouldn’t be there anymore. Shan Shan argues that she can’t just leave Liu Liu to take care of the store by herself after one accident with the Douche. Feng Teng refuses to back down though and tells her that she doesn’t need to pay back the 10 mil anymore. Shan Shan doesn’t want to leave Liu Liu and the store, but she tells him that she’ll think about it. The next morning, Shan Shan is getting ready to leave for work and Feng Teng asks her if she’s still insisting on going back to F.S. She tells him that she thought about it all night, and she’s made up her mind to stay. Shan Shan explains that even such a small business like theirs is causing them so much stress, so she can only imagine the stress that Feng Teng must have from handling a large corporation like Windgroup. She wants to learn from him and become a stronger person who can take care of things on her own. That way, she can become an even more suitable partner for him. Hearing this, Feng Teng seems convinced and doesn’t push Shan Shan to abandon F.S. anymore. Little does he know, Shan Shan spent all night thinking of this overly flattering excuse to give him. Shan Shan wins this round. At F.S., there are two newly hired guards who are standing outside of the store at all times. Shan Shan goes to ask them if they can take a break from guarding the store, especially since they’re not even open for business today. They reply that they are just following Feng Teng’s orders to guard the store 24/7. Shan Shan has no choice but to call Feng Teng to ask him if the guards are really necessary, and wouldn’t their presence scare off all the customers. Feng Teng tells her that this is the only way that he’ll allow Shan Shan to remain at F.S., so he’s not going to compromise with her about this. At least try to look friendly, guys. After Papa Xue’s visit with Feng Teng, he stops by F.S. to see Shan Shan and Liu Liu. He later pulls Shan Shan aside and gave her 50,000 to help with the debt. Shan Shan tries to refuse the money, but he insists that he wants to help her. Aw Papa Xue. 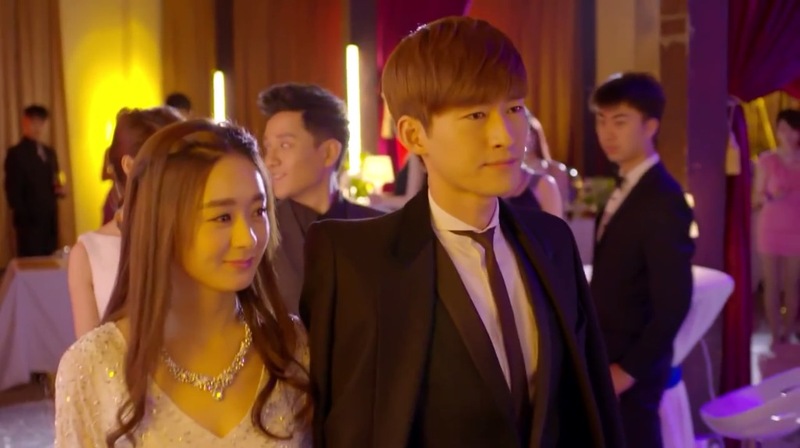 Even though Wang Hong really seems to like Liu Liu, she says that she’s not interested because he’s too young. Five years younger than her, to be exact. Feng Teng & the Invisible Shan Shan.